If the name Ragamuffin doesn’t captivate you, the taste will. Ragamuffins are the lazy cook’s (by lazy I mean me, not necessarily you) way to a little Cinnamon Roll flavor without the yeast & the wait that comes with it. Ragamuffins are basically fun little biscuits rolled out, spread with butter, sprinkled with sugar and baked off – from start to finish in about 30 minutes or less. Now, Ragamuffins aren’t really quite a cinnamon roll – the biscuit dough tastes like home-made biscuits. It really lacks any sweetness on its own so that explains the outrageous amount of sugar in the filling. See, I WAS going to cut back on the sugar when I sliced a bit off the end and gave it a taste. I unrolled them, added the rest of the sugar and rolled them back up. They needed that sugar. I adapted this recipe from Epicurious (A Maple Sugar version appeared in a 2006 Gourmet) and took the hint about cooking them in the muffin tins from Seasons and Suppers. When I grow up, I want a blog like Jennifer’s! Aren’t her photos marvelous? Her muffin tin seems to have 9 muffin cups; maybe that’s why her’s are a bit taller than mine, which I cut in 12th’s to go into my Stepmom’s ancient two 6-cup tins. I don’t think I’d make Ragamuffins for a fancy brunch or company but I would make them over and over for a quick breakfast treat for the family or a late weekend breakfast. Or maybe for an after-school snack. Or maybe an evening craving…I did mention they’re quick, right? Ragamuffins are good, but they’re rather humble fare. And just like biscuits, they’re best eaten as they’re made but can be reheated in a slightly dampened paper towel or napkin in the microwave. Jennifer says they freeze well; just reheat on a baking sheet at 350 degrees F until warm. Put oven rack in middle position and preheat oven to 400°F. Line a large (17- by 14-inch) baking sheet with foil or parchment. Whisk together flour, sugar, baking powder, and salt in a large bowl. Blend in butter with a pastry blender or your fingertips until most of mixture resembles coarse meal with some small (roughly pea-size) butter lumps. Add milk and stir with a fork until a shaggy dough forms. Gently knead dough 8 to 10 times with floured hands on a lightly floured surface. Roll out dough on a lightly floured surface with a floured rolling pin into a 13- by 11″ inch rectangle. Spread softened butter evenly over dough and sprinkle all over with brown and turbinado sugar and the cinnamon, pressing firmly to help adhere. Beginning with one long side, roll up dough snugly, jelly-roll style. Gather any sugar from work surface and sprinkle on top of rolls. Bake until rolls are puffed and barely golden, 18 to 20 minutes. Transfer to a rack to cool until warm, about 10 minutes, then run a knife around the edges of the Ragamuffins and turn out. If the rolls stick, the bottom of the muffin tin may be carefully heated over a burner to liquify the sugar on the bottom. This entry was posted in Click here for Fabulous Food Posts and tagged Biscuits, Breakfast or Brunch Dish, Freezes Well, Gourmet Magazine. Bookmark the permalink. Ooh, I like this idea quite a lot. 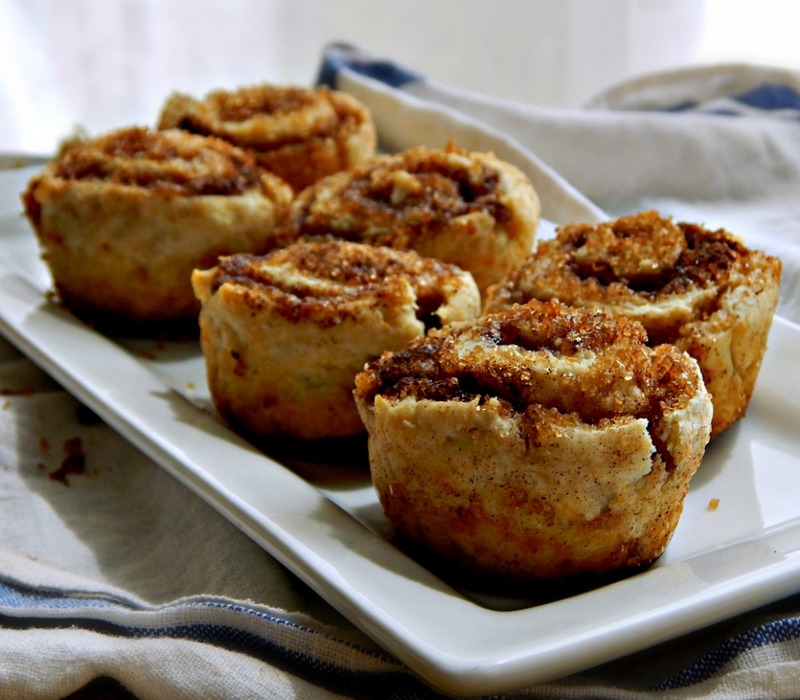 Sort of cheater cinnamon rolls. Will definitely need to give it a try! I remember the bisquick ones. These look and probably taste a lot better. Oh yes, I remember bisquick! I have a copycat bisquik somewhere on the blog. I also remember making horrible drop biscuits with the stuff, lol!! These are fun and I bet even a store bought biscuit from a tube would be a fun project for little ones! I think I have recipe ADD – I start out to look up or I see one recipe I want to make and before you know it an hour has gone by and I’ve bookmarked 35000 recipes, lol!! And forgotten all about the first one! A beautiful treat to the taste buds!! U love cinnamon. This swirl muffins sounds amazing Mollie. That made it special!! Beautiful share Mollie. 🙂 Thanks much! I loved these – I might even try savory ragamuffins now! You got me at Ragamuffins. These look amazing, Mollie. And did you say 30 minutes? Wow! I know! Isn’t that just the cutest name?! I love the smell of cinnamon rolls baking! I can see my daughter making these often. Fast and tasty sweet baked treat … how can one resist whipping up a batch?